Clifford collects his gold medal. FOR EOGHAN CLIFFORD, the overriding emotion was relief. Relief that he’d won, relief that he hadn’t been beaten and relief that he’d come through it in one piece. “I’m really fecked after today,” he admitted afterwards. Once again, he pushed himself through the pain barrier, expending every last sinew and completely disregarding what his body was telling him to do; he was going to win Paralympic gold and nothing was stopping him. His only real threat was himself. He has held such dominance over this C3 Time Trial event for the last two years that, on his day, nobody was going to come close to challenging him. The margin of victory — one minute and eight seconds — underlines his supremacy. But he had to battle with this enduring knee injury, which is a direct result of the degenerative muscle disease he suffers from. After winning bronze on the track last week, he was left in agony. How he picked himself up to produce such a stellar performance on Wednesday is remarkable. “I don’t want to overblow it,” the 36-year-old continued. “I think cyclists will always suffer but the last few days the simple act of pedalling the bike has been sore, I haven’t enjoyed it. “It was very painful out there. Yesterday I had a bit of a rant about the injury to my coach and pretty much told him I wanted to throw the bike into the sea. Anyway he stopped me and that’s probably lucky for me. “I even rang my wife this morning saying I don’t want anymore of this and she was having none of it to be honest. There was no real chance, I was always going to do this. Emotionally you’re probably down a bit but when you have the support staff to pick you up it gives you a lot of confidence. So he got on his bike, clocked a time of 38:21.79 and obliterated the field. A Paralympic gold to add to his three World Championship titles. “Apart from a Time Trial in Bilbao where I had a very bad mechanical problem, I’ve never lost one in para-cycling so I didn’t want to break that record. “It’s funny, I’m delighted but I’m also relieved. I’m the reigning Time Trial world champion and I think it’s almost more relief, it’s a funny thing. Obviously I am delighted don’t get me wrong, I’m really proud, but the first emotion in a way is relief that you haven’t lost. It’s a strange thing. 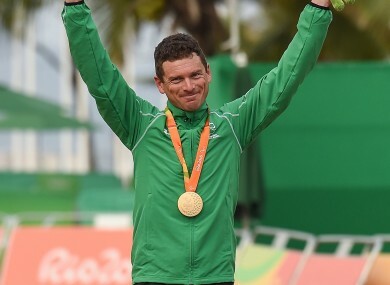 With Friday’s Road Race to come, Clifford has the opportunity to win his third medal of the Games after podium finishes in the Time Trial and Individual Pursuit. It has been a remarkable rise for a rider who only took up para-cycling two years ago. He’s fully immersed himself in the sport, dedicating his life to the cause and making sacrifice after sacrifice, both mentally and physically, to get to experience days like yesterday. Part of that has been missing valuable time with his wife and baby girl, who is just 10 months old. Becoming Paralympic champion goes some way to justifying those sacrifices. “As people know we don’t have a Velodrome in Ireland so we have to go abroad to train,” Clifford, an engineering lecturer in NUIG, adds. “I actually missed the birth of my daughter because I was in a competition in Japan and she was born a month early and I was flying over Siberia at the time. Email “'I rang my wife saying I don't want any more of this but there's no way I wasn't going to do it'”. Feedback on “'I rang my wife saying I don't want any more of this but there's no way I wasn't going to do it'”.